A recent club gathering that radiated that special sense of community was the memorial benefit for Jack Emerson, held at the Mercy Lounge. 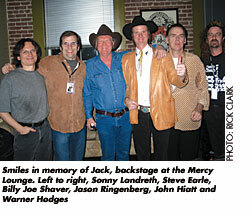 Appearing that night was a who's who of Nashville rock, alt-country and rootsy singer-songwriters who had been touched by Emerson's passion for great music and business integrity, including Steve Earle, John Hiatt, Sonny Landreth, Jason Ringenberg (of Jason & The Scorchers), Webb Wilder, Billy Joe Shaver and many others. We usually like to cover projects that are being recorded for major and larger indie labels in this column, but sometimes, the crush of songwriters and artists underwriting their own projects and getting things done on favors, a wing and a prayer need to get some juice, too. So the rest of this �Skyline� is dedicated to a talent that has been working hard on the fringe and deserves a look and listen. Mike Younger is one of those local artists who has been pushing the proverbial rock up the hill for some time in an effort to get his music out to the world. He isn't your average guy, having first started playing on the streets and living as a squatter on New York's Lower East Side before making his way to New Orleans for four years, where he used to take shifts on a street corner with a juggler performing for tourists. WWOZ disc jockey, former MC5 manager and political activist John Sinclair became a fan of Younger's and gave him an open invitation to play on his radio show. Younger took up Sinclair's offer and after only playing a couple of songs, the station got a call from Nashville publisher Chris Keaton, who caught the show while driving through New Orleans on his way to Texas. He arranged a meeting, and soon Younger moved to Nashville, eventually hooking up with Rodney Crowell, who would produce Younger's 1999 indie debut, Somethin' in the Air. While that album got some airplay on AAA stations and performances at the Sundance Film Festival and the 2002 New Orleans Jazz and Heritage Festival, the album didn't sell and momentum began to flounder. In October 2002, Younger decided that Nashville wasn't where he needed to be and made a move back to New York City, settling back into the East Village near St. Mark's and Avenue A with longtime friend and pianist Bob Packwood. The two started playing together at some of Younger's old haunts, including 9C and Eric �Roscoe� Ambel's Lakeside Lounge, and eventually assembled a band that included bassist Skip Ward and veteran Southside Johnny drummer Louis Appel. All the while, Younger was writing new songs and getting antsy to record again. Enter two of Younger's best buds from Nashville � engineer Rob Clark and manager, booking agent and promoter Brian Wagner � who urged him to make another record. Instead of waiting around for a record label to advance him some money, Younger dug in and started working construction in New York and then went up to Maine and harvested blueberries along with seasonal migrant workers. Eventually, Younger saved up the cash that would ultimately fund his Nashville album project, which is tentatively titled Tooth and Nail. When Younger returned to Nashville, he brought the band with him and even paid them per diems out of his savings. To make the new album, Younger enlisted Clark to engineer and co-produce. Clark had started out in Nashville four years ago answering phones at a studio on Music Row, and meeting and eventually assisting on sessions with guys like David Thoener, Jim Cotton, Bil VornDick and many others. Ultimately, Clark worked exclusively with producer Roger Moutenot, who started turning over more and more engineering duties. �I was fortunate as an assistant to work with some great artists like Alison Krauss, Nickel Creek, Marty Stuart, Emmylou Harris, Ralph Stanley and Taj Mahal,� Clark says, adding, �Roger has also exposed me to some great rock and pop acts like Guster, Beulah and Michelle Branch. It's been hard to break through to the first-engineer chair, but the time I spent with the great engineers that I assisted definitely helped me feel confident and ready to take on the job. The project was tracked for three days at Masterlink on a Pro Tools|HD3 rig through the Neve V3 console and utilized the studio's great assortment of outboard pre's and classic microphones. After tracking, the project moved to Moutenot's studio for overdubs and some preliminary mixes. Clark tried a few different mics on Younger's voice before deciding on a Neumann U67. 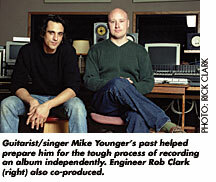 �Mike has a lot of character in his voice, but you have to be careful around 4 kHz,� says Clark. �The U47 just brought out too much of that part of his voice. �The drum sound comes mostly from a pair of U87s set up in the British standard technique, going through a pair of Neve 1081s with a Neve 33609 compressor lightly working on the front end,� continues Clark. �I also used kick and snare mics to fill out the direct part of the sound. For the room, I used a pair of U87s bused together with a Coles ribbon mic, and then compressed the resulting stereo image with an Alan Smart compressor. The bass is a blend of amp and DI on separate tracks, each going through a 1073 and then an LA-2A to smooth out the peaks. The electric guitar was recorded with a 57 and a Royer 122 active ribbon mic, each through a Neve 1066, and then bused together and compressed with a �black-face� 1176. Piano is a pair of U48s through V76s, and then an 1178. Listening to the rough mixes, highlights on Younger's album range from the rough-and-tumble bar-band rock of �Soul Searchin',� to the bluesy �Devil's on the Rise� and the reflective and topical �Everyday War.� The songs and the playing are strong; it's obvious that Appel is one rock-solid groove drummer � what a feel!